This week at TCC the children are learning about people in community service. So far we have met a Bethany police woman and today the Bethany Fire Department came with their fire engine and their hose! It was great fun. This morning I took Maddie with me to see Bubba and she was able to see the firemen and spray one of the hoses! How fun! 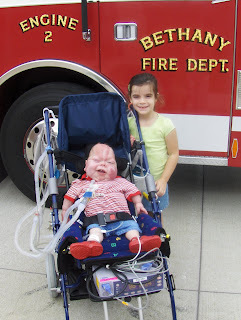 Of course, Fletcher was too small, so she told the fireman she wanted to spray the hose for her Bubba! Then Maddie was able to go to school with Fletcher and Fridays are music therapy day. So she sat right next to her Bubba and sang and played instruments with him. Today they started to practice for the Treble Makers concert which will be August 16th. You all are invited to come if you'd like!